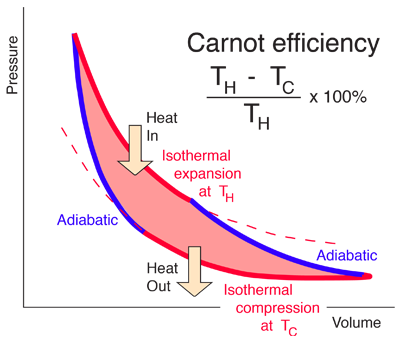 The most efficient heat engine cycle is the Carnot cycle, consisting of two isothermal processes and two adiabatic processes. The Carnot cycle can be thought of as the most efficient heat engine cycle allowed by physical laws. When the second law of thermodynamics states that not all the supplied heat in a heat engine can be used to do work, the Carnot efficiency sets the limiting value on the fraction of the heat which can be so used. In order to approach the Carnot efficiency, the processes involved in the heat engine cycle must be reversible and involve no change in entropy. This means that the Carnot cycle is an idealization, since no real engine processes are reversible and all real physical processes involve some increase in entropy. The conceptual value of the Carnot cycle is that it establishes the maximum possible efficiency for an engine cycle operating between TH and TC. It is not a practical engine cycle because the heat transfer into the engine in the isothermal process is too slow to be of practical value. As Schroeder puts it, "So don't bother installing a Carnot engine in your car; while it would increase your gas mileage, you would be passed on the highway by pedestrians." Any real engine cycle will result in more entropy given to the environment than was taken from it, leading to an overall net increase in entropy.